Both Luke and I have been on quite the reading kick lately. We've been trying to limit our screen time (I'm talking both the iPhone and the TV) and fill that time with reading. Our upstairs extra bedroom has become our reading nook and we'll try to get in some quality book time each evening before we go to sleep. We've both been using Goodreads to keep track of the books we've read and the books on our to-read list. We started the Reading Challenge on Goodreads this year and it's been a great way to keep us motivated and on-track with our reading goals. I'm currently sitting at 6/10 books for the year but I'll probably increase my goal to 15 because there are so many books on my list that I can't wait to dive into. 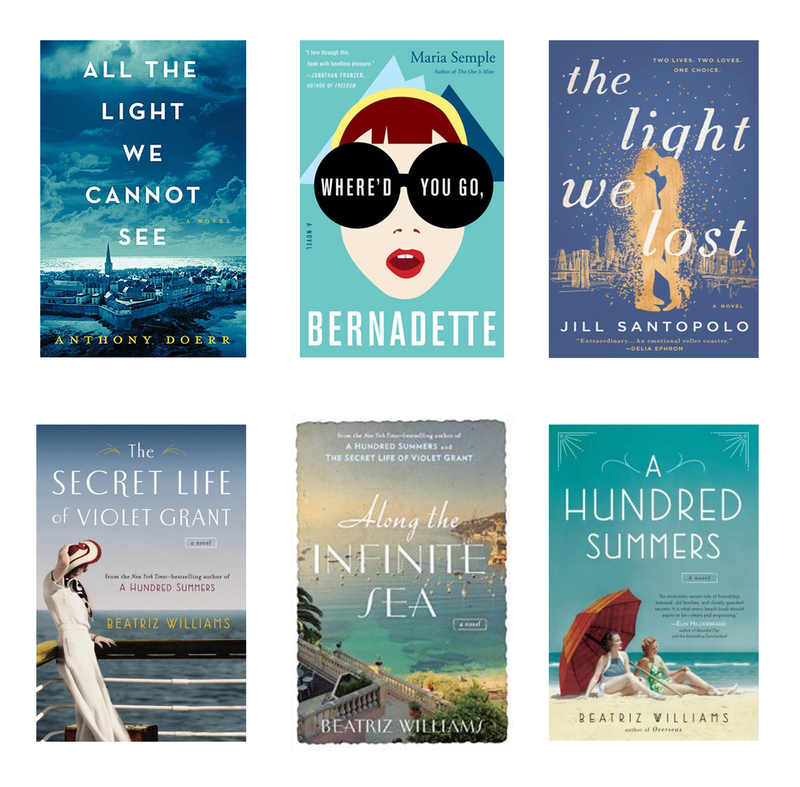 I'm sharing my six recent reads, all of which I would highly recommend! All The Light We Cannot See | I just loved this book, it was heartbreaking and beautiful at the same time. The two main storylines are well-written and full of life and imagination. I loved how the stories of the main characters were intertwined and I couldn't wait to see how they came together. Where'd You Go, Bernadette | This was a fun and quirky read. I loved the flawed mother-daughter relationship and found that aspect of the book very relatable. The story is quite outlandish, yet widely entertaining. Living in Seattle for three years, I found the city references to be spot-on (the book takes place in the Emerald City), which made the book a bit more special to me. The Light We Lost | I still don't have the words to describe how this book affected me. Lucy, the main character, is such a strong and relatable woman and throughout the book she shares her most intimate thoughts on love and defining moments in our lives that can change the course of our future. You'll feel love, hope, laughter and intense sadness as Lucy narrates her story. The Secret Life of Violet Grant | I had a hard time getting into this book for the first half. Stick with it though because it does get better, in fact it becomes great! Beatriz Williams is known for her take on historical fiction and colorful characters. She has the great ability to weave through time and connect characters along the way. This book tells the story of a young woman uncovering secrets that her family has kept hidden, a process that helps her deal with her own troubled events. Along The Infinite Sea | Of all the Beatriz Williams books that I have read, this one is hands down my favorite! The main characters, Annabelle and Pepper, couldn't be more opposite, but their stories have heartbreaking similarities. As with all Beatriz Williams books that I have read, she weaves the stories over multiple decades and this one is no different. Along The Infinite Sea fills you with love, loss and so many questions along the way. The characters all have their struggles they deal with and the consequences of their actions alter their future in ways you would never imagine. If I had to describe this book in one word it would be beautiful. A Hundred Summers | Another Beatriz Williams book because I just lover her writing style. I read this book while on vacation and finished it within a few days. After you've read a few of Beatriz's books you'll notice that characters from her other books make cameo appearances. It makes the characters feel more real to me, knowing that I've read about them elsewhere. Lily and Budgie are childhood best friends that have summered with their families in Rhode Island for as long as they can remember. After losing touch over the years, Budgie and her new husband (Lily's ex-fiance) return to the scene and over the course of one disastrous summer, secrets come to life and lives are forever changed.